Two fan belt tensioners with their holders. Tensioners can be sold separate from the holder. Brand new. From ford polokwane. 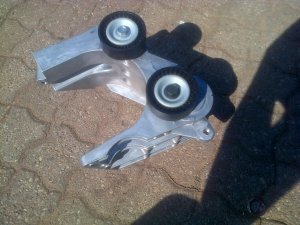 Quality.R200 each tensioner.low prece for a brand new. R2000 when buy the whole part. Ford Ikon with Papers Price Negotiable.